Welcome to Sihanoukville in south Cambodia! Are you doing a snorkeling trip in Sihanoukville? If you're planning on booking a snorkeling trip in Sihanoukville, this will include the island of Koh Russei (Bamboo island). 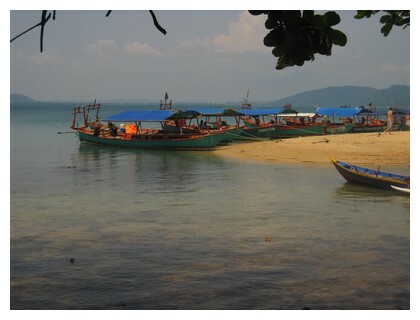 Bamboo island is located about 10 km from Sihanoukville. If you want to get away from the mainland, Bamboo island might be the right option for you! 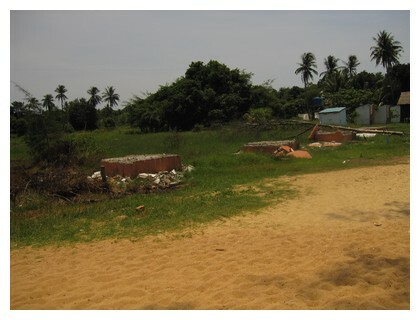 Our last trip to Sihanoukville was in April 2010. We booked a snorkeling trip through Coasters on Serendipity Beach. Price: The tour cost $15 and included lunch on Bamboo island. On board the long-tail boat we were handed snorkeling masks, but not swimming fins. The equipment itself was worn out and almost useless. So bring your own snorkeling mask if you can. Arriving on the first island we only saw a couple of fish, but otherwise there was nothing much to see down there. I was expecting colorful corals, not dead ones. The next island was Koh Russei (known as Bamboo island). Here we were allowed to stay for three hours (from 11 am to 2 pm). We went around the island, taking walks on the golden strip of sand. Palm trees, a golden beach and a sunny day gave the impression of being an idyllic island. And the beach was alright: clear water and a nice temperature. Do you want to hear the downsides? Well, it was just depressing to see all the trash and glass bottles lying around, especially where the boats dock. And we even had our own audience: Cambodian kids and youth staring us while we were bathing. It was awkward. After Bamboo island we drove to the third island. Again, we were disappointed. "The only thing I have seen during this snorkeling trip is a red jelly fish." There are a couple of accommodations to choose from on Koh Russei. 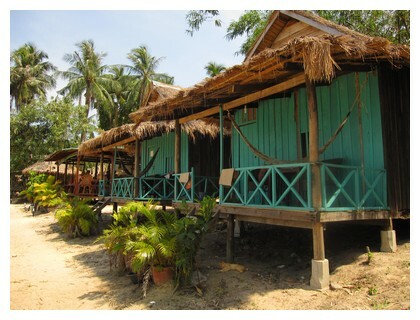 We noticed some turquoise huts near the dock at a price of $15 per night (Bim Bam Boo Bungalows). I was allowed to take a look inside one of the huts, and it was fairly basic. The nicest part was the hammocks – a good place to relax and get a view of the ocean! Don't know how to set up an itinerary for Cambodia and Southeast Asia? Get all the help you can get with this step-by-step guide on how to create an itinerary. Learn how to create a good and realistic itinerary for Southeast Asia.